Imedeen Time Perfection – 60 tablets. Imedeen Time Perfection provides vital nutrients and acts as your anti-ageing skin defense. Improve mature and sun-damaged skin from within. Start on the path to younger looking skin today. Imedeen Time Perfection is an advanced formula that contains Biomarine Complex, exclusive to Imedeen, and LycoPhence GSTM, a patented skin-defense system. It helps promote healthy, supple and radiant skin and reduces the visable signs of ageing. It is tested safe and proven in clinical studies. 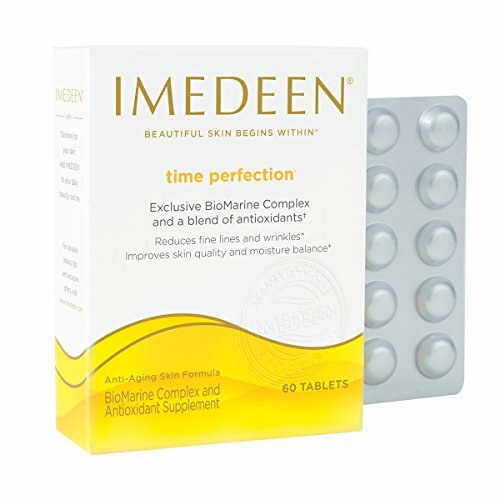 Imedeen Time Perfection tablets optimize skin quality and moisture balance and reduce fine lines and wrinkles in just 12 weeks.